Considering this is the LEFTOVERS from City Hall blog, I figured it might be appropriate to post the full interview I did with Diamond Bar man Harry Soo, a national barbecue champion. The story ran online and in the paper Tuesday, but due to space constraints, it didn’t run in full. Here is there full length interview. Happy grilling! 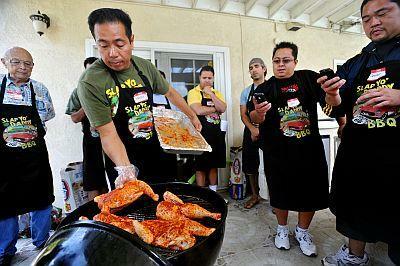 Harry Soo, a Diamond Bar resident who runs Slap Yo’ Daddy BBQ, recently won their fifth grand championship of the year on July 3 in Stockton. Soo and his company have rapidly become one of the most prodigious barbecue competitors nationwide. Soo is now teaching a barbecue class once a month to reveal some of his secrets and tips to prime barbecue. Soo took the time to answer a few questions regarding barbecuing, give some tips and talk about some of his favorite things to cook. What is the most common mistake people make when using the barbecue? Most common beginner mistake is doing too much. One of my barbecue wisdom sayings is ‘less is more.’ That is, less rub, less smoke, less sauce, and less add-ons. For example, beginners very often over smoke their barbecue. For beginners, what are some of the first things you recommend? What meat or recipes should they start with? A very tasty and forgiving meat to start your barbecue journey is chicken. It’s inexpensive and easy to prepare. Make a simple rub with something salty like kosher salt, something sweet like sugar, something with color like chili and paprika, and some spices. Sprinkle on your chicken pieces and put skin side up into a 275 degree oven or charcoal smoker or gas grill. Do not touch it and let it cook until internal temperature is 175 degrees. Brush on your favorite barbecue sauce, let set for 10 minutes, remove and enjoy. On your web site, you say grilling and barbecuing are not the same thing. What’s the difference? Grilling is cooking directly over high heat, usually over 300 degrees. BBQ is cooking indirectly with lower heat, less than 300 degrees. Both are good depending on the meat you are cooking. Grilling is good for meat that is tender. In technical terms, tender meat contains strands of protein called collagen that are loose, examples include chicken and fish. Conversely, low and slow barbecue is good for meat that is not tender, which is attributable to very tightly coiled strands of collagen. Examples include pork ribs and beef brisket. Low heat for long periods will loosen the chewy collagen and transform the meat into a tender delicious state called gelatin. Understanding this little bit of food science will put you on the right path to creating moist and tender barbecue. If you were trying to convince someone to become more of a barbecue user, what would you tell them? Simple, have them taste properly smoked low and slow authentic American barbecue. Once you have tasted good barbecue, you’ll never go back to the steam grilled barbecue you find in those chain barbecue stores. No names mentioned but they rhyme with Rome. Barbecue is the only true authentic American food. We stole everything else — the pizza, hotdog, hamburger, noodles, etc. — from other countries. No other culture in the world cooks meat low and slow for up to 12 hours above ground. The Hawaiians cook for long periods too but it’s below ground. Barbecue was borne out of necessity when the plantation owners would give the workers less cuts of meat and the workers learned to start a fire and cook it low and slow so supper would be ready when they returned home after sunset. I’ve had many folks sample my barbecue pork and they literally fall into a stupor called ‘hog heaven’ because the mini explosion of flavor in their mouth is like a symphony that evokes intense visceral emotion from the combination of smoke, meat, rub, sauce, and all the messy goodness. One of the problems I always run into while barbecuing is flare-ups on the grill, how should I handle that and what can I do to prevent it? Have a spray bottle with water and spritz the meat to put out the flare up. Also, you can move the meat to a cooler spot on your grill. What is your favorite thing to barbecue? Rib tips. They come from the top portion of a pork sparerib. When a sparerib is trimmed into a St. Louis rib, the top portion of the sparerib is removed. That piece is called the rib tip. More barbecue restaurants will have rib tips if you ask for them. There is no better eating barbecue than rib tips. What makes cooking on the barbecue more enjoyable, and taste better, than other means? Barbecue is just honest food. If cooked properly, it’s amazingly delicious stuff. Pair it with some classic sides and you’ve got a plateful of authentic American food ala apple pie. The smoke, char, rub, sauce, and tender meat is a universally loved. That’s why grilling and barbecue is found in every culture in the world. Meat plus smoke plus rib equals happiness. What do you prefer in the age-old debate — gas or charcoal grill? Both are good if you know what you are doing. As I always say, it’s the pitmaster, it’s not the pit. We’ve proven that simple point while cooking on the competition circuit with a pair of Webers we bought off Amazon for $200 each and have beaten many teams countless of times who are brandishing $30,000 custom pits. For more information or to register for one of Soo’s classes, visit www.slapyodaddybbq.com. Welcome to the big leagues, Diamond Bar councilwoman Ling-Ling Chang. You won a council seat in November and have occupied it a mere four weeks. But you’ve already done something to irk some people. Already, a group (or what appears to be one) is bent on keeping tabs on you. A recent example: “Citizens Watching Councilmember Ling-Ling Chang” has been circulating e-mails about a recent Chang vote. At a Dec. 15 meeting, the city council approved the contract of a city consultant Gary Neely by a vote of 3-2 with Chang voting in favor. The problem, however, the group alleges, is that Chang took $198 in contributions from Neely in her successful council run. She did, according to her campaign finance statements. A review of the other Nov. city council candidates — from current council members Steve Tye and Ron Everett to newcomers David T. Liu, Robert Velazquez, Lucy Huang and Shawn “S” Dhand — didn’t reveal any other Neely contributions. The group didn’t return two follow-up e-mails seeking comment and more importantly, questions of who they are. Unfortunately, we are not willing to disclose our names out of fear of political retaliation and rebuke by the New Diamond Bar Council Majority, because we will be ridiculed by the Councilmembers Herrera and Tye on the truth that we are trying to convey if anyone would listen and wake up!